A fourth co-defendant in the case of a shooting during a drug transaction at Urbana University last fall pleaded guilty to a felony drug trafficking charge Tuesday in the Champaign County Common Pleas Court. Ryan M. Rowland, 20, pleaded guilty to one count of trafficking in marijuana, a fourth-degree felony. One-year and three-year firearm specifications were dismissed as part of the guilty plea. Rowland went with Hunter Donnan and Brandon J. Craft to Urbana University on Nov. 6, 2018, with the intent to sell marijuana to Ryon W. Lucas, an Urbana University student. An investigation by the Urbana Police Division found Lucas and Dioro C. Geroski intended to steal the drugs from the men. During Tuesday’s hearing, Rowland said he went with Donnan and Craft to make sure nothing happened to them. When they arrived at the dorm room where the transaction was to take place, Rowland said Lucas told him to leave the dorm because there were too many people in the dorm. During the transaction, Geroski brandished a handgun and struck Donnan in the head with the gun. Craft had a loaded revolver in his waistband while completing the drug transaction. When he observed Donnan get hit, Craft started to pull his revolver from his waistline. Geroski then struck Craft in the head two times, causing Craft to drop his revolver. When Craft was struck in the head with the handgun, the gun fired. Everyone in the room ran out and left the campus. Rowland said Tuesday he did not know Craft had a gun in his possession during the transaction. Rowland faces a potential maximum sentence of 18 months in prison and $5,000 fine. Previously, Rowland admitted to and was found guilty of a bond violation after testing positive for marijuana use. Rowland’s bond was continued and he was advised future positive tests will result in revocation of bond. During Tuesday’s hearing, this bond violation was rescinded by the court after Judge Nick Selvaggio said the court was not sure of when the violation occurred. Last week, Craft, 18, pleaded guilty to one count each of trafficking in marijuana with a specification for forfeiture of property and carrying a concealed weapon and Lucas, 21, pleaded guilty to tampering with evidence and robbery. 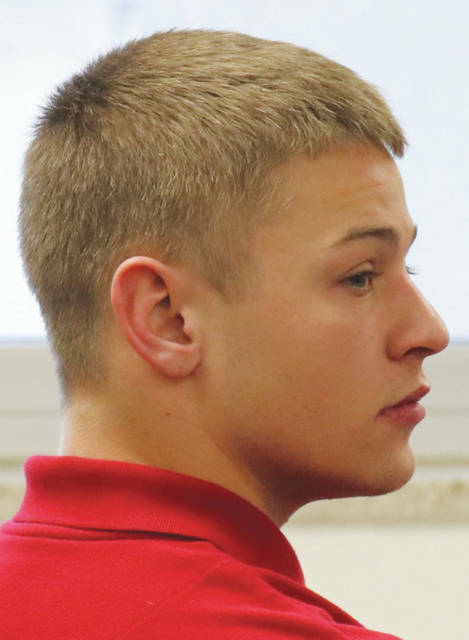 In January, Donnan, 18, pleaded guilty to two counts of trafficking in marijuana. Geroski, 23, is charged with two counts of felonious assault with one-year and three-year firearm specifications and aggravated robbery with one-year and three-year firearm specifications. During hearings in the case last week, Champaign County Prosecutor Kevin Talebi stated he had not been apprehended. No sentencing date has been scheduled for the four individuals who have pleaded guilty to charges in the case. Selvaggio said the court will review the four cases and then decide whether sentencing will be delayed or if sentencing will take place soon for the four cases.